We hear a lot about the benefits (and not) of smaller class size. 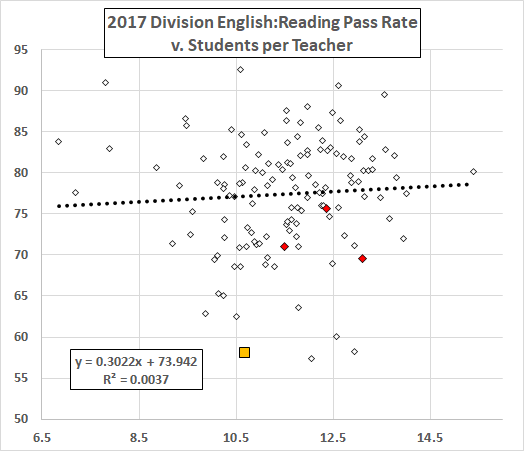 To start, here are the division average reading pass rates plotted against the number of students per teaching position. Notice the large range here, from 6.85 in Highland to 15.4 in Prince William. 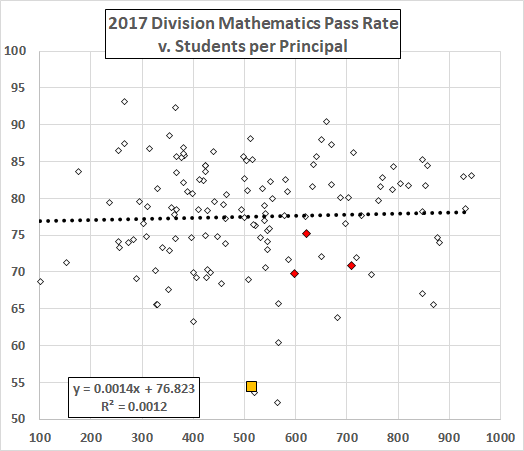 The average of division averages is 11.5. The gold square is Richmond at 10.7 students per teaching position. The red diamonds are the peer cities, from the left Norfolk, Hampton, and Newport News. 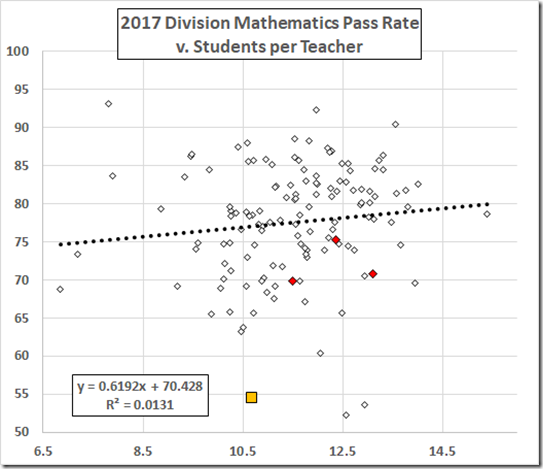 Recall that smaller classes mean smaller ratios so look to the left for “better” in terms of class size. 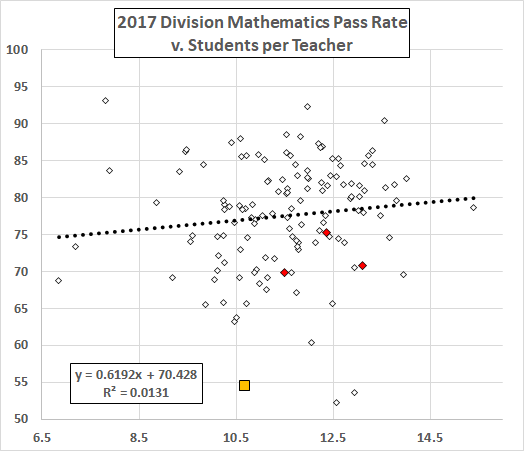 The fitted line has a slight positive slope (0.3% pass rate increase for an increase of 1.0 in the student/teacher ratio), suggesting that smaller classes are associated with lower pass rates. But the R-squared value, 0.4%, tells us that the two variables are essentially uncorrelated. 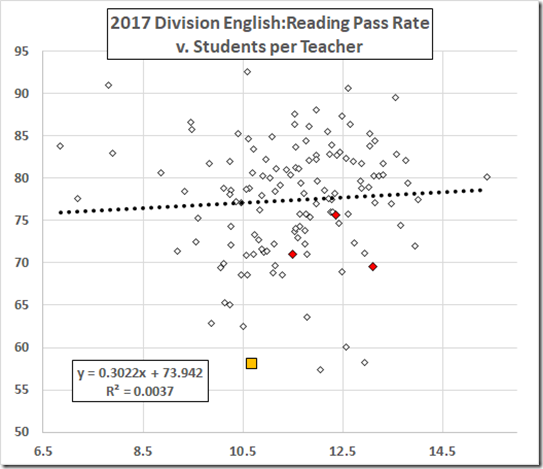 On these data, it looks like those divisions that are hiring more teachers per student are not, on average, getting any reading benefit from the extra money. We’ve also heard that Richmond has more small schools than usual, on purpose. 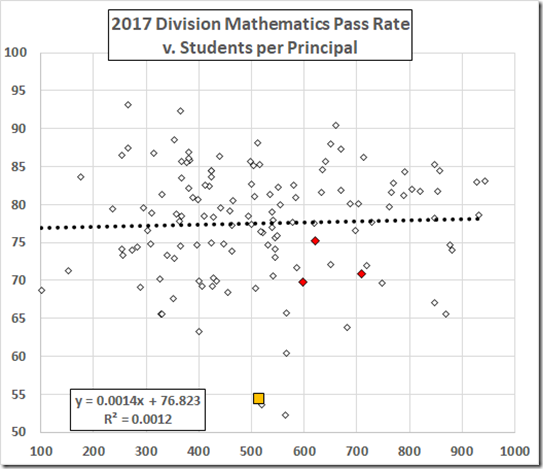 We can get a measure of the number of schools in a division by counting the principals. 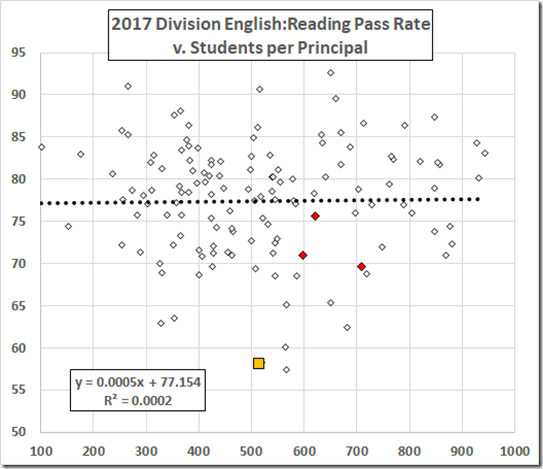 The Richmond average is 514 students per principal while the average of the division averages is 515. The range, again, is surprisingly large, from 101, Highland again, to 943.6, Chesterfield. 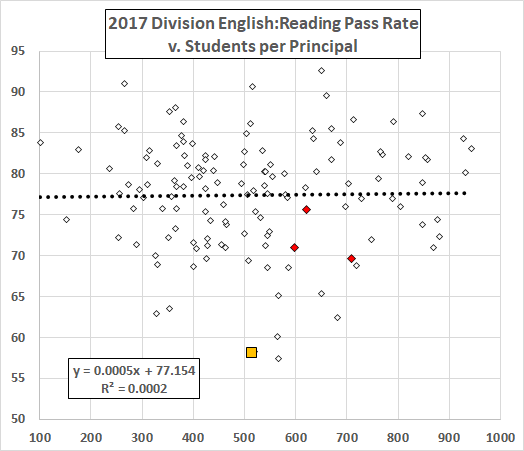 The graphs do not suggest a benefit from Richmond’s average school size vis-à-vis the peers. So, next time RPS tells me it wants to replace some of its ancient infrastructure with other small schools, I’ll tell ‘em to take my share in stock in a nice James River bridge.